When I think of my grandmother, many things come to mind. She was full of life, funny and frugal, yet so very generous. This was a woman who waterskied well into her sixties, climbed into a bullpen at the Stockyards (bull was dozing) to collect fertilizer for her garden, and made long underwear a three-season fashion staple through her judicious use of the thermostat. At the same time, she always included a friend in need at her holiday table. Some years, she kept our meal warm while we made a quick delivery to a bedridden acquaintance. I have nary a recollection of unwrapping a birthday or Christmas present from my grandmother. All the gifts she gave were from her heart, measured in time, not dollars. There were really long walks on the beach, collecting shells or driftwood for later projects, which always involved a glue gun. We played elaborate connect-the-dot games on the chalkboard at the bottom of her basement stairs or on a random scrap of paper. She had us for sleepovers, forgot to notice the clock at bedtime, and let us scoop our own ice cream. Enough said! Over the years, we baked dozens of cookies, froze gallons of applesauce, and canned quarts of tomatoes. As I got older, I scheduled my visits to her Fountain Avenue home to coincide with these seasonal activities. My time with her was precious, and she came to appreciate the help with the more tedious tasks. Of my grandmother’s many mouth-watering concoctions, her chocolate peanut butter eggs had, perhaps, the biggest following. Because it simply wasn’t enough to enjoy them only at Easter time, she made ball-shaped versions for Christmas or as a special treat. For years now, I have carried on the tradition, giving countless boxes to family and friends as a small way to remember my grandmother and keep the memories alive. Sometimes, I dip a few of the eggs in unsweetened chocolate. I am a fan of dark chocolate, in general, and love this truly bittersweet pairing. The sweetness of the peanut butter filling provides a interesting counterbalance to the bitter chocolate. If curious, you could set aside a few of the eggs and experiment with a bar of melted unsweetened baking chocolate. Click here for the Coconut Cream Egg recipe, shown with the peanut butter filling, above. 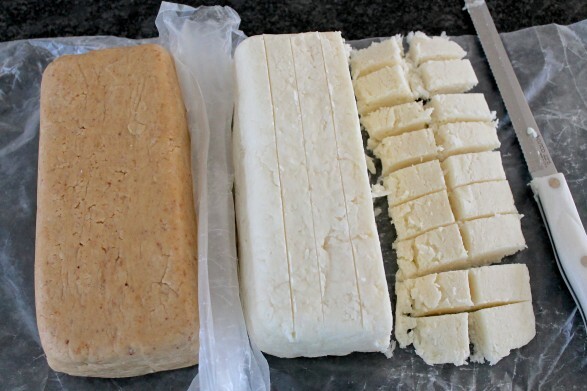 For ease of preparation, you can mix, roll, and dip the eggs in separate stages. Simply cover and refrigerate in between. Breaking down the steps makes this somewhat tedious task quite manageable. I roll the eggs fairly small and get about 100 per batch. As mentioned, these make wonderful gifts and also freeze well, although the recipe can easily be halved. In the recipe below, I offer some helpful tips as well as details on how to temper chocolate if you prefer to purchase a high quality chocolate that requires this step. Good melting chocolate (often sold in disk shapes) works quite well though. If you live close to a Wilbur Chocolate source, it is what I use and I highly recommend (although there are many other delicious option). Wilbur offers both the melting chocolate (available in the bulk aisle at some grocery stores) and a higher quality option (available at Wilbur’s Lititz factory store and Evans in Willow Street) that requires tempering. When finished, I refrigerate the eggs and pack either in airtight containers or white craft store boxes (tied with a pretty ribbon) for gift giving. We like to eat the eggs cold; some people prefer them room temperature. Either way, they are delicious! Mix all of the ingredients except the sugar until thoroughly combined. Then, stir in sugar, a third at a time, until completely incorporated. (I find this easiest to do with my clean hands.) Next, I form into a big rectangular block so that I can slice into equal-size pieces for rolling. At this point, you may wrap in parchment or wax paper, and then again in plastic wrap, and refrigerate for up to a few days. When ready to make the eggs, the dough is easiest to work with when cold. 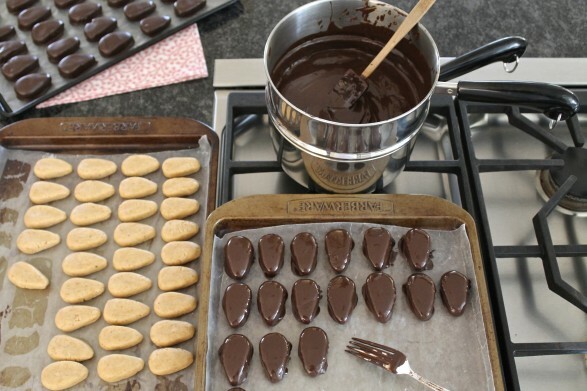 Using about a tablespoon of the mix at a time, form into oval or egg shapes, placing them on a parchment or wax paper-lined baking sheet as you go. 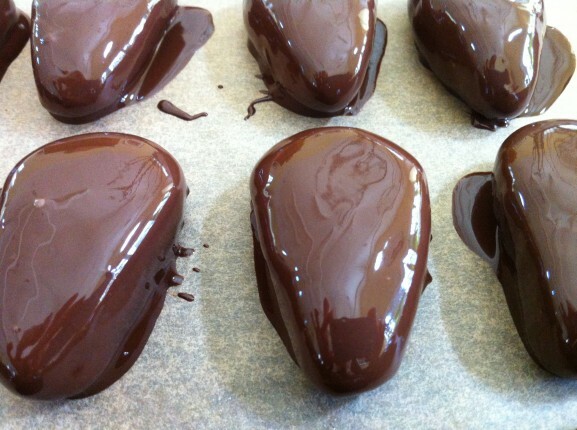 When finished, you may again cover and refrigerate until you are ready to coat the eggs in chocolate. Finally, melt the chocolate in a double boiler, keeping the heat very low. Dip the eggs and remove to a parchment-lined baking sheet. I like to keep twenty or so out at a time, leaving the remaining eggs in the refrigerator. They will be easier to dip when they are cold. I have tried the utensils made for dipping chocolates, toothpicks, and any way I can think of to make this process easy and less messy! The way that has ultimately worked best for me is to use a dinner fork. I drop the egg in the chocolate, roll gently to coat, and lift it out with the fork. Hold the egg on the fork for a few seconds, allowing the excess chocolate to drip back into pot, and then gently slide off the fork and onto baking sheet. If you end up with “feet”–a puddle of chocolate that pools around the egg–you can gently break this off once the chocolate hardens. My kids, however, think these are the best ones because they get more chocolate! Note: One year, I thought I would be smart and put the dipped eggs on a cooling rack figuring this was a fast, easy way to drain the excess chocolate. Don’t do it! The eggs stick to the rack, even if greased, and the bottoms will break off when removed. If you want to try tempering chocolate: I’ve had a few questions on this subject, so here is a quick how-to. I used to buy the chocolate melting disks that don’t require tempering, which is totally fine. Chocolate with a higher cocoa butter content will require this step. The main risk you run if you don’t temper it properly is that the finished chocolate looks a little streaky. It will still taste fabulous. What I do, however, is melt a portion of the chocolate at a time–maybe 8 ounces–over low heat in a double boiler. Then turn the heat off and add about a quarter cup (no need to measure, just a small handful) of chopped chocolate and stir it in. This brings the temperature back down which is how it tempers. I turn the heat back on when I need to add more chocolate or if the chocolate cools too much and starts to thicken. Repeat the process as needed, adding a little more chopped chocolate after the bigger chunks are melted. When you are melting chocolate in the microwave (which I often do when making Oreo, pretzel or salted almond bark; see website for these recipes), you can use a similar process. Just heat in 30-second intervals, stirring as you go. When all chocolate is just melted, stir in some chopped chocolate and let it melt in the heat of the already warm chocolate. I do find that the stovetop method works best for the extended process of egg dipping. Once dipped, the chocolate should be put in a cool place to set up properly. 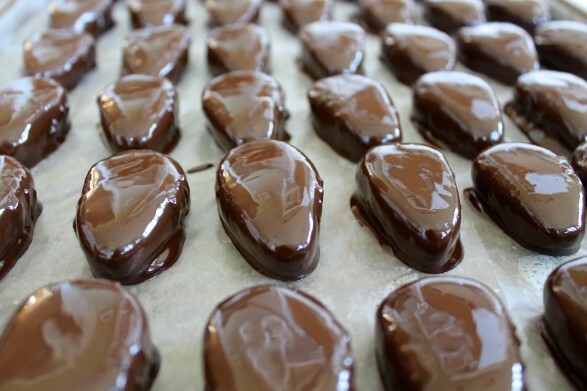 I put the baking sheets of dipped candy in the refrigerator or near a cool window to set and fully cool. Stored in an airtight container and refrigerated, the eggs will keep for several weeks–if they last that long! They also freeze well. If you are partial to Coconut Cream Eggs, or would like to see a few of my favorite (and easy) ways to use the leftover chocolate, click on the highlighted recipe titles for the instructions and more photos. I use this same recipe! I don’t even remember where I got it from, I’ve been making them for so long. It would be Easter without them. I just wish there was an easier way to dip them. This was my grandmother’s recipe and I have no idea where she got it. They were a favorite from my childhood, and I spent many years making them with her. The dipping part is the most tedious part, but I find–after many years of doing this–it always goes a little faster than I think it will! I like using my chocolate fountain for dipping. In fact, that’s the whole reason I bought it. Are there other ways to melt the chocolate if you don’t have a double boiler? (Or do you have suggestions on how to mimic a double boiler?) Thanks! For years, I created a makeshift double boiler by putting a smaller pot in a larger pot. Someone also told me today that she likes to use her crock pot. I have never tried that method, however. When do you plan on making them? I can bring my double boiler to church on Sunday! Hey Ann…. I can’t tell you how touched I am that you would think to lend me your double boiler — a week before Easter, no less. I’m going to try the makeshift methods for now or my crock pot and if I get stuck, I’ll let you know. Thanks so much for your thoughtfulness, though! Absolutely and good luck…and don’t hesitate to let me know! Silly question… Can these be shipped? Wouldn’t the creamcheese spoil? I would love to make these and ship to a friend. While I do store these in the refrigerator, my grandmother always left hers at room temperature and they lasted quite some time. I probably shouldn’t recommend it–especially since the box could get hot during the shipping process–but chances are they would probably be okay. Maybe you could wrap them well and add a few of the ice packs designed for shipping? Hello! I just googled “homemade peanut butter egg recipe” and a bunch of stuff came up but I chose to click on yours! I live in Wyomissing, Pa. and was just out and about in the Lancaster/Lititz area! I just passed the Wilber Factory an hour ago! My family and I love Lancaster County! We are there often all year long! Especially in the upcoming seasons! I also follow “Fig Lancaster” on instagram! I can’t wait to give the egg recipe a try! What a wonderful message and an unbelievable coincidence! Thanks so much for taking the time to comment, Gretchen, and I would love to hear how you make out with the recipe if you try. Enjoy your upcoming visits, and Happy Easter to you and your family as well! I live in Womelsdorf and we were just talking about going to Wilbur to get chocolate to make eggs and clicked on this recipe. What a coincidence!! That is a coincidence! I love all these small-world stories. Thanks for the comment! Another lovely candy recipe. I’m going to have to master my kids’ love to cook so they can help me. We love cooking special things for holidays and your recipe is perfect! Thank you, Lorraine. Maybe the kids will help if they know what the end result is!! I make the coconut and peanut butter eggs every Easter. If I make them too far in advance they somehow seem to disappear so I usually end up making up another batch so we actually have some for Easter! They really are the best!! We have that problem, too: ) I am so glad you love them as much as we do! Is it OK to use natural peanut butter – the kind that must be stirred to incorporate the oil? Yes, Bess, and great question. I have used natural peanut butter often, and either variety works beautifully. I hope you enjoy! I am making these now and its turning out good! Thanks for the recipe. I am currently living in northern PA but am originally from Lancaster, PA and I miss Wilbur chocolate so much! You cannot buy it up here and no one has even heard of it:( Also, I am best friends with the owners of Evans candy on Willow Street. Thought it was neat I was searching for a recipe on the world wide internet and found this one from down home 🙂 Thanks again, cant wait to see how the eggs look all coated and finished! Happy Easter! What a small world, Evey! We love our visits to Evans…always good things to be found! Thanks for your great comment, and I am thrilled you are making these delicious treats. Enjoy! such sweet recollections of your grandmother. Would love to taste these eggs – they look like the best. Whoa…these are amazing and I really like reading your posts. Keep up the good work! Hi, i made these over the holidays and they were a huge hit! Thanks so much for the recipe! Thanks for letting me know. I’m thrilled they were a success! Pingback: The Fountain Avenue Kitchen – Easter Eggs, Buckeyes and easy treats using leftover dipping chocolate! How wonderful that you made the candy making a family adventure. Thanks for the great comment, and I’m thrilled they were a hit! Have you ever made crispy peanut butter eggs with this recipe? I just made these and they are a huge hit…now I’m trying to figure out how to add rice crispies for another batch. Hi Jenn, I haven’t, although I’ve made homemade Crunch bars where I stirred in Rice Krispies, and that worked well. I’m so happy these were a hit, and I’d love to know if you make a crunchy version that you like as well! The best coconut eggs ever! I am now doing the PB thanks for sharing your recipe! Awesome news, Cindy! Can’t wait to hear what you think of the peanut butter version! Excellent! The PB with chocolate tastes like fudge! Again thanks!!! You’re welcome, Cindy! So glad you like! Hi Ann I just came across your blog and enjoy it very much. I lived in York Pa and went to Lancaster often. My family was actually from Lancaster. My cousin had a piano business there. I just got back from the grocery store and got the items to make your coconut and peanut butter eggs. I will be using your blog quite frequently thank you and very nice to meet you. So nice to meet you, too, Linda and great to make the local connection. I hope you visit often and find many more recipes to enjoy — and I’d love to know how you make out with anything to you try. The peanut butter and coconut eggs are definitely a favorite here! Your comment brings such a smile to my face, Beth. I actually just shared it with my mom, as I know it will brighten her day, too. Cheers to our special grandmothers…and all the delicious things that came out of their kitchens! Must the pb eggs be refrigerated? I saw a post that they keep well on the counter. For instance I like to leave butter on counter. Thanks! Hi Shirley, The eggs keep very well on the counter but can be refrigerated for those who prefer to eat them cold or for extended storage. They freeze well, too. Hope you enjoy them as much as we do! So excited to try this recipe. They look awesome!! These and the coconut eggs are both excellent. 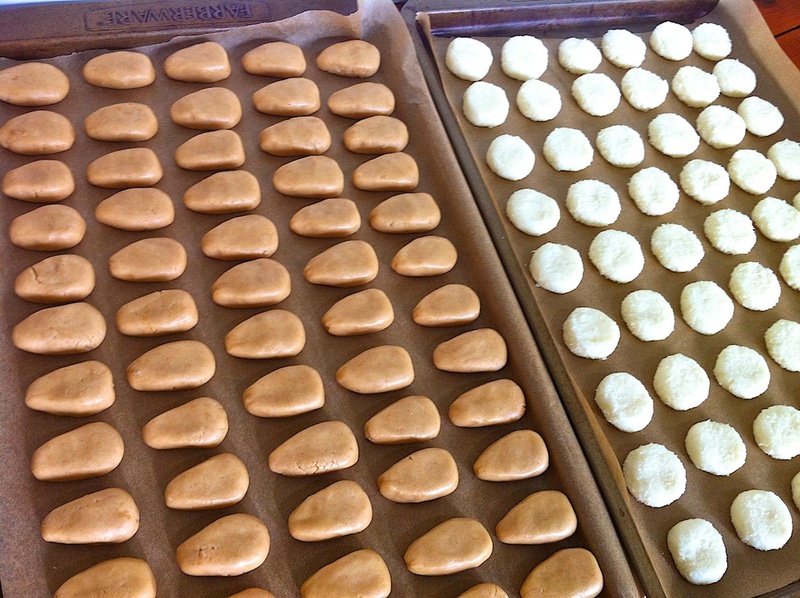 I make the filling at other times of the year and make “truffles”. My name is Colleen and am from Pottsville, Pa.
Do you have a fav. brand of chocolate you like to use? I am also wondering if I can use the Coconut Egg recipe for Butter Cream Eggs? Hi Colleen, I typically go to Evans Candy on Willow Street Pike in Lancaster and buy their bulk chocolate. I’ve also used their melting wafers, which don’t require the tempering mentioned in the recipe. Evans uses Wilbur Chocolate, which you may be able to find closer to you if you’d like to try it. As for the coconut egg recipe, my recipe is basically a butter cream recipe with coconut added. Although I never make them without coconut (we have many fans! ), it should work well that way. If you try, I’d love to know how you make out! My recipe has fluff not cream cheese. Mary, I’m thrilled this made the process easier after all these years and I’m curious about your recipe. My kids would perk up at the mention of fluff in the peanut butter eggs!